Guided Math The First 25 Days is the latest book in my Guided Math series. The book was inspired by the many teachers I have trained in Guided Math over the years. 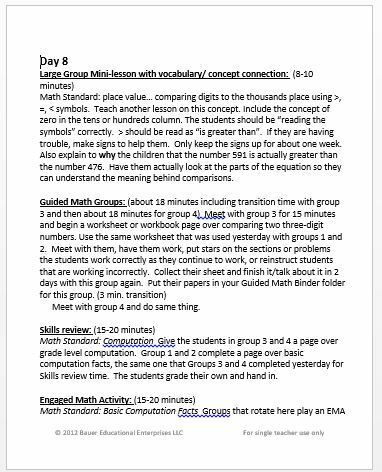 After attending a Guided Math professional development workshop, teachers kept asking for a detailed description of how to transition their students to Guided Math groups and stations. I listened. Guided Math The First 25 Days is an implementation handbook for teachers of Kindergarten through seventh grade. This book explains how to set-up a Guided Math format in any classroom. This resource manual contains 5 weeks of actual lesson plans that help teachers to plan Guided Math lessons according to their own grade level math standards. Each week focuses on the behaviors and process of transitioning students to math workshop stations. In fact, I purposefully designed this resource book so teachers would understand the process of planning for and meeting the needs of every Guided Math Group, in essence every student in the classroom. If you would like to look at a few pages, let’s do just that. 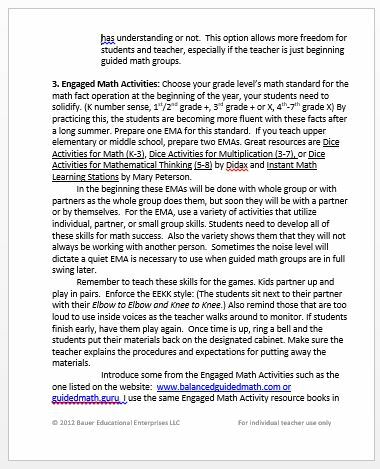 Below is page 9 that explains Engaged Math Activities for Guided Math. It begins to discuss the student behaviors for Math Stations and some resources for finding some great EMAs! Each rotation of Guided Math is described in the first chapter. This page details Engaged Math Activities and teaching the student behaviors for Guided Math. Here is Day 8 of Guided Math The First 25 Days. You can order your copy by clicking on the book icon on the main page. You can also check it out on Amazon.